Oh dear, how far behind are we here? I don’t want to defend my lack of screening logs (we’re now three weeks behind), but as you may have noticed, it’s been a big couple weeks for LabuzaMovies, and now with a whole new project getting launched, I may have fallen off the boat for a bit. But we’re back, baby! -Limelight, 1952. Directed by Charlie Chaplin. 35mm projection at Museum of Modern Art. -The Steel Helmet, 1951. Directed by Sam Fuller. 35mm projection at Museum of Modern Art. -The Life of Oharu, 1952. Directed by Kenji Mizoguchi. 35mm projection at Museum of Modern Art. -The Earrings of Madame De…, 1953. Directed by Max Ophüls. 35mm projection at Museum of Modern Art. -Born on the Fourth of July, 1989. Directed by Oliver Stone. DVD. -Margaret (Extended Edition), 2011. Directed by Kenneth Lonergan. DVD Projection at Landmark Sunshine. -Daises, 1966. Directed by Věra Chytilová .35mm projection at Brooklyn Academy of Music. -The Battle of Algiers, 1966. Directed by Gillo Pontecorvo. 35mm projection at Film Forum. -One from the Heart, 1982. Directed by Francis Ford Coppola. 35mm projection at Museum of the Moving Image. -Rear Window, 1954. Directed by Alfred Hitchcock. 35mm projection at Brooklyn Academy of Music. -The Sugarland Express, 1974. Directed by Steven Spielberg. 35mm projection at Film Forum. -The Clock, 2011. Directed by Christian Marclay. Digital Projection at Lincoln Center. We live in an age where things are supposed to be big and important. We don’t go to films to watch the mundane, but to see things as great than they possibly are. Every action becomes ACTION. A thought isn’t just a passing moment but essential to life. And we are all doing it at every moment. 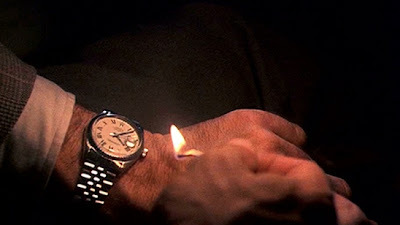 I was surprised by reaction the Christian Marclay’s epic art-video installation project The Clock. What originally intrigued me about it—its winking cinematic references, small little quirks between different films, and general wit—made me furious and eye rolling. However, another narrative (or at least my idea of a thematic narrative) slowly developed. 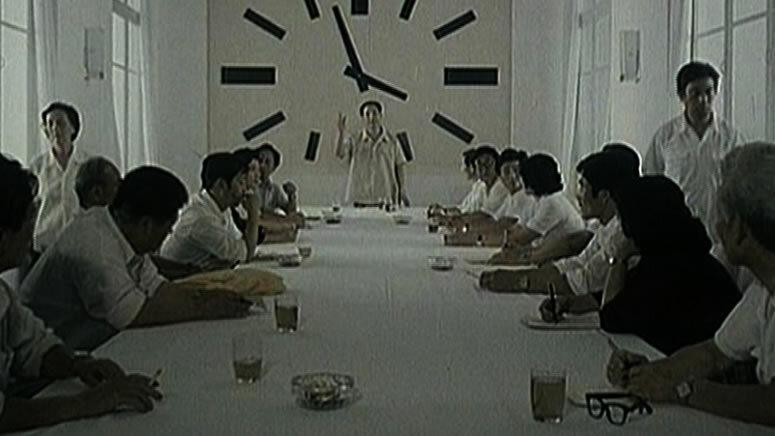 For me, The Clock was not about watching time unfold in a truly cinematic fashion (I think Tarkovsky still has the rights on that), but instead it’s a socialological experiment on how our culture sees time and what we ascribe certain minutes and hours to be. For those who haven’t heard of The Clock, it is a 24 hour art installation project made up of countless movies. The type of films—new, old, foreign, domestic, black and white, color—is irrelevant, and in fact as I will argue, the less you recognize what film the scene is from, the better. The trick though is that every shot in the film is supposed to correspond to what time it is in actual life. Some of these moments are big in the respective films—at 8AM, we see the hundred clocks of Doc Brown in Back to the Future causing their commotion. But many are simply shots with clocks in the background or off to the side; the time almost irrelevant. Because of the high demand (and small amount of space) to see the free event, I actually have only seen about a third of the film—I went from 3AM last night to about 10AM this morning, in which my body told me “that’s enough clock for you.” For a film with no narrative, I was surprised how easily I was wrapped up in the non-action. Sometimes, Maclay enjoys being on the nose or at least clever. One character dials a phone, another in a different film answers it. Sound effects bleed into each other, as if Marclay wants all film to exist in the same universe. And he often chooses many scenes in which time is commented one. None of this is bad per say, but it all felt a little too hollow. Marclay’s insistence on putting these scenes together often felt like a “hey look at me” experience. In the long New Yorker profile with him, the writer talked about the little intricacies of seeing actors age in reverse or different things like that. But those little details felt like small frothy pleasures than something purely different. But that’s not what The Clock was for me. Film has been used for over a century to capture the human experience, and The Clock reveals our own sociological impulses to place certain details and ideas at certain times. Starting at 3AM, I first experienced murder, crime, and snooping. Couples were often in bed, but one was often wake. Nobody slept perfectly well. People kept waking to disturbances, either physical or mental. As time went on, men slowly crept back home from their trysts to join their wives. Singles drank whiskey and scotch, making eyes at each other during the late hour. And the murders eventually stopped, instead replaced by dreams and nightmares (which peak around 5AM). And as the day hours passed, we saw how people reacted to the morning sun. Japanese women rose early to prepare breakfast and tea for their fathers and husbands. Alarms went off, which was met with every reaction one could think of. One night stands tried to awkwardly explain to each other the actions of last night. Husbands and wives greeted each other with coffee and breakfast. Streets slowly became populated. Men and women rushed to just make it on the last train. Many realized they had overslept. What The Clock revealed for me is that so much of our filmic language is built around time, and how so much of that time has a specific meaning in our culture. 8:59 is a huge moment—the calm before the storm of work. Detectives usually come to find dead bodies just before 6AM (Bill Holden’s shot body in Gloria Swanson’s pool was a little earlier than the rest of the cops getting their start—he’s found at 5AM). Board meetings begin just before 10AM. Toast is the most popular meal. Older couples take their time during work. Everyone goes for one last kiss. 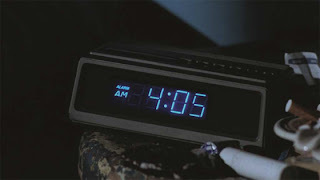 Everyone is always angry when woken up at 4AM—“It’s 4 O’Clock!” might be the most repeated line in the film. The pleasure of cinema is that no one film is the same. 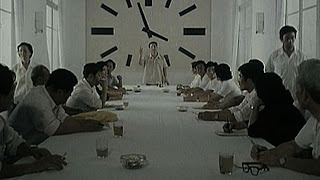 But what The Clock reveals is how similar our films and film narratives can be. Because we focus on the time, the cinematic style and the actors fade away and only the action remains. We watch life pass through The Clock. Sure, Marclay also wants to be clever. Perhaps my thoughts on what The Clock may change when I see the film in its entirety (I missed the very important hours of noon and midnight). But he has something genius buried, whether intentional or not. He’s created a sociological study of our conception of time and the meaning we give each moment.